1 Day Trip to Mt.Longonot Hiking Safari. Mount Longonot is a composite volcano located southeast of Lake Naivasha in the Great Rift Valley of Kenya in Africa. It is thought to have last erupted in the 1860s. Its name is derived from the Maasai word Oloonong’ot, meaning “mountains of many spurs” or “steep ridges”. Mt Longonot is just less than 9100 feet above sea level with a tree filled interior and a lonesome steam vent to the northeast. A climb up Mount Longonot is an ideal day trip from Nairobi. The day trip hiking departs from Nairobi at 0700hrs after a healthy served breakfast at your hotel and then the drive takes about an hour. With a drive from Nairobi along the Great Rift Valley escarpment, the stunning view of Mount Longonot beckons, barely 60km from Nairobi. There are a number of viewpoints on the highway to this mountain which have become popular stopovers for the motorists drawn by the splendor of this outstanding view. The entire mountain is a National Park within the jurisdiction of Kenya Wildlife Services. Hiking on this mountain takes approximately 2 hours from the Park Gate to reach the rim of the crater rim and descent back to the gate. The hike going round the crater rim would mean another two hours, thus the total hike takes approximately 4 hours for the round trip. You might want to include a visit to Lake Naivasha for a sunset boat ride to see hippos before return to Nairobi. The path up the mountain slope is pretty steep and can get slippery at some points. Thus, hikers need to be reasonably fit to take part on this hike. 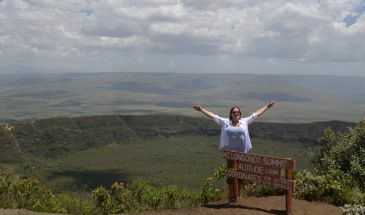 The magnificent views from the crater rim itself are however worth every painful step and the effort. This day hiking is of moderate difficulty with steep climbing. Terrain has fine dust, with loose gravel in some areas of the hike. You should bring with you comfortable hiking shoes, light clothing, extra drinking water, snacks and picnic lunch for this Mount Longonot day trip hiking tour You will have started early to avoid the heat of the Sun but by the time you reach the end of the second section you would have generated your own heat. This hike is not an easy hike but is achievable by people of average fitness. After the hike you leave to Nairobi arriving by late afternoon.